Parents need child care in order to obtain and retain a job. Children need a safe place to be that promotes their healthy development while their parents are working. The child care industry is an important economic driver within states. In fact, throughout the country, child care has an economic impact of $99.3 billion. 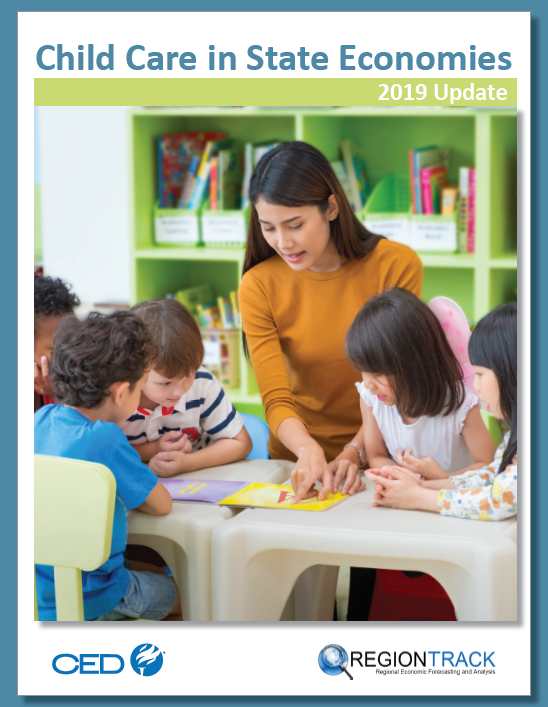 The Committee for Economic Development (CED) released a report, "Child Care in State Economies: 2019 Update" on January 31, 2019. There are 674,332 child care programs (centers and home-based sole proprietors) throughout the United States with revenue of $47.2 billion, employing 1.5 million workers. The spillover impact of these programs (purchases of goods and services) generates an additional $52.1 billion in local economies. With regard to employment, beyond direct jobs within the industry, an additional 507,089 jobs are supported within communities leading to an overall jobs impact of 2 million workers. Find the report, executive summary and state by state fact sheets and talking points on CED's "Child Care Impact" web page. Individual state infographics are posted as well. Vermont: Blue Ribbon Commission on Financing High Quality, Affordable Child Care (2016) Infographic.